Knötel says von Brühl's designation was dragoon. The fellow above in a fusilier-like cap may be a member of the usual mounted grenadier company found in European Dragoon Regiments. 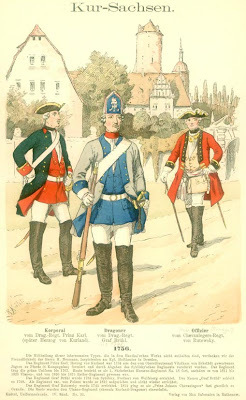 Knötel says these were added to Saxon dragoon regiments starting in 1730. On May 9th we played another game in the Jacobite Rebellion series that we started last year. We played this game at my house in Dekalb. The players were Keith, Bill, Jim and myself (Randy). The sides were Jim and I as the Scottish while Bill and Keith ran the British forces. The battle scenario was Price Charles intercepting the column that was sent relieve the siege of Carmudgeon Castle. Prince Charles set up a defensive position on a long hill that connected two villages to repel the British relief column. Lord Murray (Jim) was on the left and Lord Talisker was on the right with Prince Charles watching from the center. The battle started with the British advancing in a line running the length of Prince Charles’ defense with a Grenadier Battalion advancing on the road on the Scottish right side into the Village. After the initial musket exchange the Scottish troops used their best weapon on the center of the battle, a charge into the British line. The initial charges brought good success opening the British Line on Lord Murray’s side of the center by routing a British Battalion off the table. On Lord Talisker’s side, the British where pushed back but the stayed on the field of Battle. The British Grenadiers attacking the Pike men on the Scottish Right Side. The Blade and Von Bergman are having a drink together while the battle started. The British Artillery Battery decided to fire on the Scottish Artillery Battery. Bill delivered a fantastic dice roll destroying both guns in the Scottish Battery. (Note: Counter Battery fire is not that effective in destroying guns with these rules so this was one heck of a dice roll). Things where starting to look grim on Lord Talisker’s side and he committed his last reserve, a unit of Highlanders being accompanied with the character “The Giant”. They charged a British unit winning the melee and causing the British unit to route. They then pursued and caught the routing British unit which destroys the unit in our rules. This unit then reformed on the British edge of the table and charged the British Artillery Battery from the rear capturing the guns. At the same time as “The Giant’s” great display of heroism, another Scottish unit charged a British Infantry unit, won the melee which caused the British infantry to route. However the dice roll decided they would not pursue. This left that unit out in the open for Bill’s Horse Grenadiers to attack. The Horse Grenadiers then charged the disformed Scottish unit but the Scottish unit failed their morale check and routed before the Horse Grenadiers could make contact. The Giant Charges with a Scottish unit. The Giant and Troops Continue the attack versus a British Artillery Battery. Horse Grenadiers causing trouble for the Scottish troops! At this point all players realized the Scottish forces would be pushed of the field of battle. We did not have as much strength left as the British forces did. They good news was that the British would not have enough strength left over to push through to the besieged Carmudgeon Castle. The British players gave a good game pushing on the Scottish forces and hurting the Scottish units with good musket fire. They delivered when they needed to. At the end of the game we decided that all special characters that fell in the game would receive a roll to see if they where wounded or died in the game. So we used the same roll we would use for a campaign casualty recovery and both “The Blade” and “Von Bergman” were wounded not dead. The Blade is going to take four months to recover and Von Bergman is going to take 6 months.